A song of empowerment for breast-cancer awareness. In May of 2001, the Pittsburgh Affiliate of the Susan G. Komen Breast Cancer Foundation was marking the 10th anniversary of its annual Race for the Cure. Penny Anderson Brill, a violist in the Pittsburgh Symphony Orchestra, and breast cancer survivor, introduced then Pittsburgh Symphony Assistant Conductor, Lucas Richman, to members of the Pittsburgh Affiliate with the intention that he might write something to commemorate the occasion. 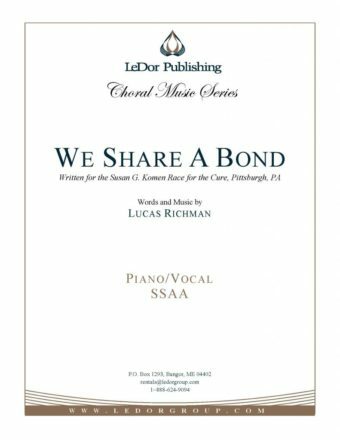 The resultant song of inspiration and empowerment, We Share A Bond, was premiered on Mother’s Day that year by a choir of breast cancer survivors and members of the Pittsburgh Symphony. Performed annually in Pittsburgh since then, the song was introduced at Knoxville’s Race for the Cure in October, 2004. The Knoxville Affiliate subsequently approved a grant in order to fund an official recording of the song. The Knoxville Symphony Orchestra recorded the instrumental tracks in May, 2005. A choir of breast cancer survivors and supporters was assembled in Los Angeles to record the vocal tracks in September, 2005. Partial proceeds from all purchases of the recording, scores and/or instrumental parts are donated to organizations that serve as advocates for breast cancer patients and survivors. TOGETHER WE HAVE STRENGTH TO STAY ALIVE. THAT HELPED ME PREPARE FOR THE STRUGGLE YET IN STORE. THAT MIGHT SHED A LITTLE LIGHT ON THE UNKNOWN. WHO HELPED ME UNDERSTAND THAT I WASN’T ALL ALONE. WHO SAW HER LIFE GROW SHORTER EVERY DAY? BUT THIS IS WAR AND NOTHING’S GOING TO GET IN MY WAY! ‘CAUSE MY THIRST FOR LIFE CANNOT BE SATISFIED. WITH OTHERS WHO MUST KNOW HOPE AND FAITH CAN TURN THE TIDE.